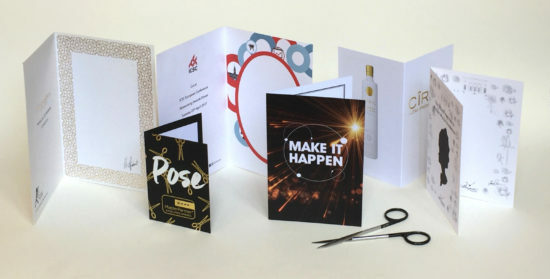 ILHOUETTE BACKING CARDS can be branded with a corporate logo and a short message. Or, for weddings, we can add your own names and silhouettes to the cards. 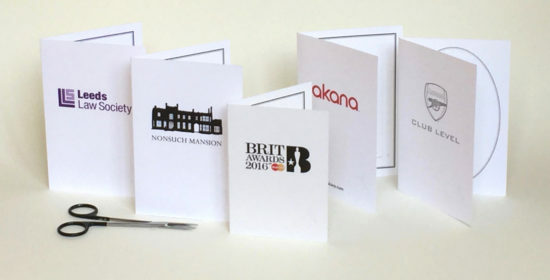 You can choose from three kinds of cards: standard, branded and bespoke cards. These are the cards we provide free of charge at all our events. They feature The Roving Artist logo on the front and a short history of silhouettes on the back. 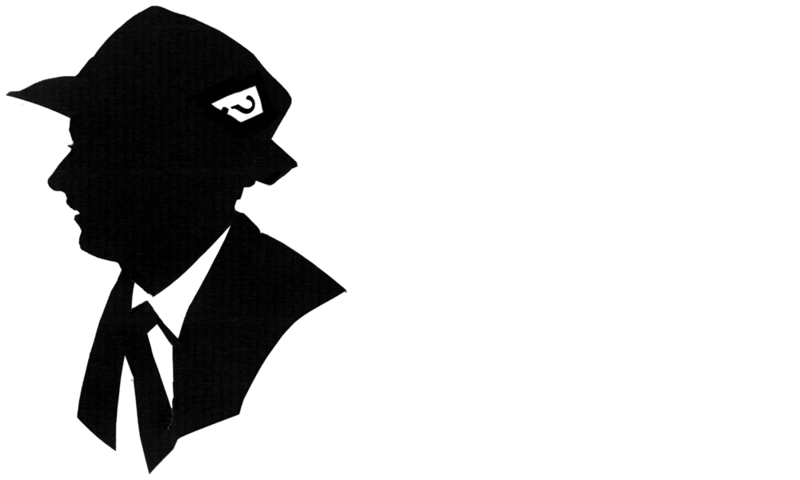 They come in a range of sizes to suit as many different kinds of silhouette as the artist can make. Standard silhouette backing cards. Each artist has their own set, often in a range of different sizes. We recommend branded silhouette backing cards for both corporate and private events, and especially for weddings and birthday parties. To make them, we use our standard cards as a template, so they are simple and inexpensive to make,. You will need to send a copy of your logo, and/or some short wording for us to add to the card. We will send a proof before printing so you can check for any errors or omissions. 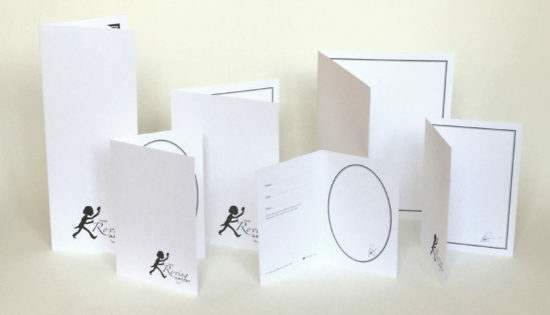 Branded silhouette backing cards: made by adding your logo to the front of our standard cards. 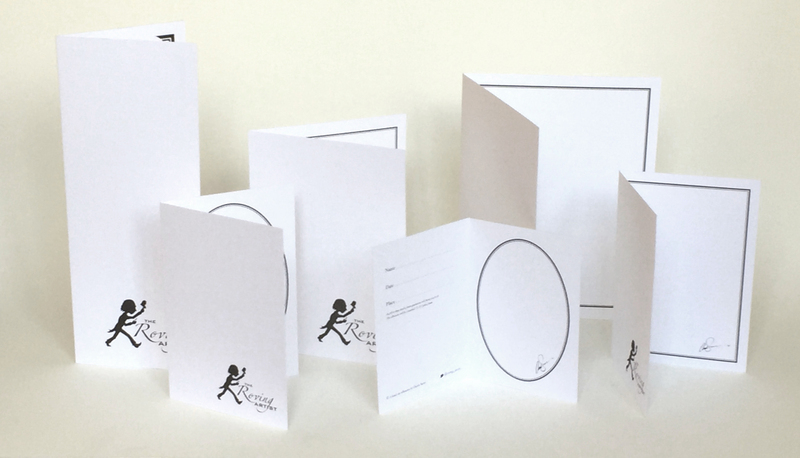 Bespoke silhouette backing cards are suitable for conferences, or themed events where the silhouettes need to match your event branding. These cards take more time, and so cost a little more., but anything is possible. We take your event artwork and re-interpret it to make a practical, stylish and unique backing card for our silhouettes. We will send a number of proofs before printing, to make sure you are happy with the design. Bespoke silhouette backing cards: if required we can completely redesign our cards to suit your event. Samples of all these cards can be supplied by post or email. Please ask. It is also possible to work with plain white cards – without any contact details or logo at all – if the nature of the event calls for this. There is no extra charge for this. Silhouette thank-you cards are made after event, using cuttings made on the day. They are most popular for weddings, although can work for any private event. If sent to print the day afterwards they will be with you a week or so later, in good time to send thank-you notes to all your guests. Silhouette thank-you card: printed after the event using silhouettes cut on the day. These can be made quickly and arrive complete with envelopes for posting to your guests. 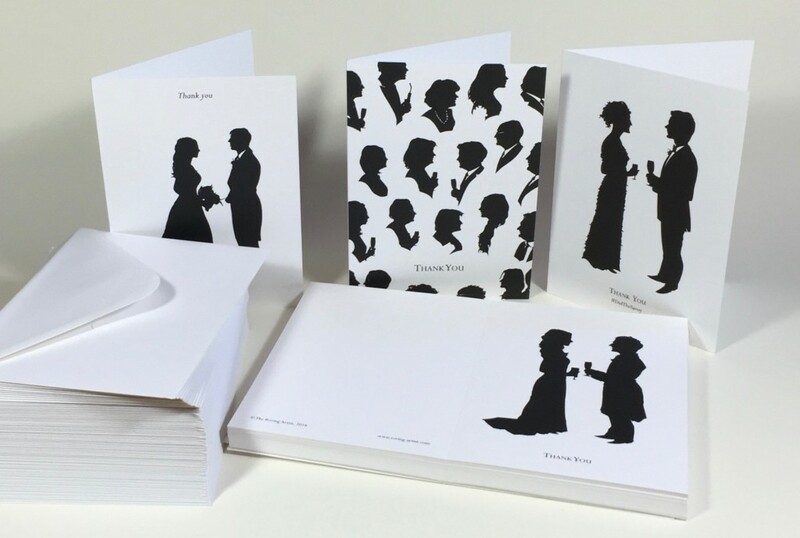 The front of these cards features key silhouettes from the event, for instance the bride and groom. The inside is left blank for you to write our own message. They arrive complete with matching envelopes. Please enquire about cards when booking the artist. We will send you a price list and may ask you to provide a copy of your logo and any other artwork or wording related to the event. We will make an initial layout and work with you to finalise the design. HENRY FORD’S famous quote about customers having cars “… any colour that they want so long as it is black” rings true for silhouettes. He should have been a silhouettist! However, it is possible to cut branded silhouettes from coloured paper. Think about chocolate-coloured silhouettes at a chocolate-themed party, or picking out the exact shade of blue from your corporate logo.